An idiosyncratic sampling of the latest science papers: Oil and corn don’t mix (at least for the Gulf of Mexico); How snakes climb ropes (and why they climb ropes); Energy not housing crashed the economy. Plus a bonus video of elk partying in Yellowstone. One hundrd seventy million gallons of oil was bad for the Gulf of Mexico. But so are biofuels. A new study by the USGS finds that converting fields from cotton to corn increased the nitrogen load in parts of the Gulf watershed by 7 percent, adding to the Gulf’s seasonal hypoxia woes. 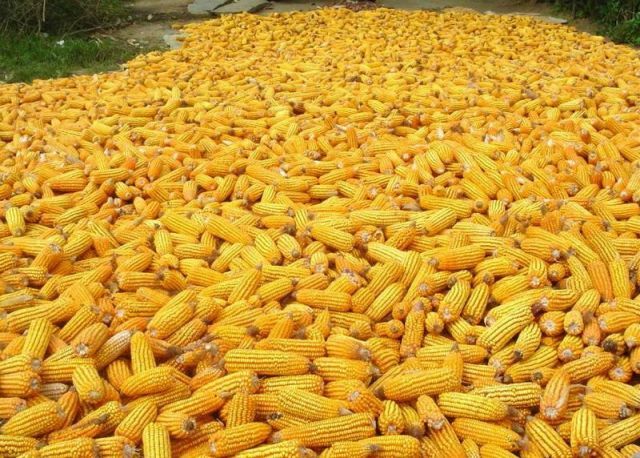 The problem stems from the USDA Biofuels Initiative, which promotes corn over cotton and has reduced cotton acreage by 47 percent, while increasing corn acreage by 288 percent, between 2006 to 2007. Furthermore, cultivated corn uses 80 percent more water than cotton and is acclerating the depletion of the Mississippi River Valley aquifer, which is currently being drawn down faster than rain can replenish it. Credit: Pratheepps, courtesy Wikimedia Commons. Declining energy quality could be root cause of the current recession, according to a new paper in Environmental Research Letters. Yes, the real estate bubble burst, but that’s because everyone paid more for electricity, gasoline, and heating oil, leaving less for mortgages. The paper outlines a new way to measure energy quality—the Energy Intensity Ratio (EIR), which calculates how much profit is obtained by energy consumers relative to energy producers. The higher the EIR, the more economic value consumers get from their energy. Analysis of past recessions showed the longest and deepest downturns since World War II were preceded by sustained declines in EIR for all fossil fuels. The author suggests that to grow the economy again, Americans need to produce and use energy more efficiently—as happened after the last energy crisis, when fuel efficiency standards were raised, more natural gas was used for electricity, and new technologies coaxed more oil from the ground. 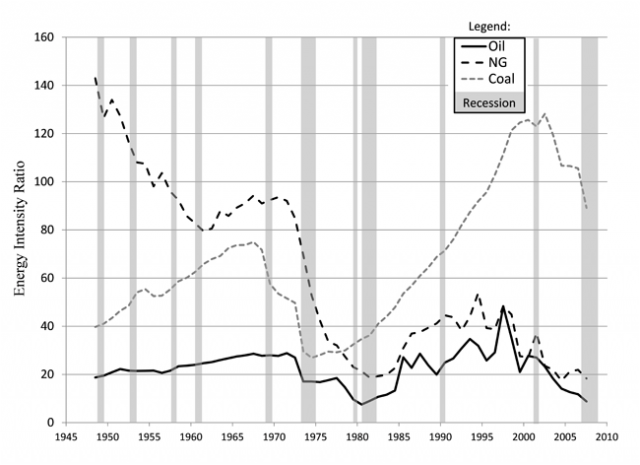 The worst recessions of the last 65 years were preceded by declines in energy quality for oil, natural gas and coal. Energy quality is plotted using the Energy Intensity Ratio (EIR) for each fuel. Recessions are indicated by gray bars.